FETTUCCINE ALFREDO FOR VALENTINE’S DAY | Jane Lear. Writing on Food and Travel. Better than a box of chocolates. That’s what I thought, at any rate, when I found the dried egg fettuccine in the kitchen cupboard. DeCecco smartly packages theirs in a box, which protects the nests of delicate golden noodles from getting crushed in the pantry supplies. Tucked away in the back of the cabinet, this looked to be in perfect shape. In a perfect world, I’d make the pasta myself, but that is not in the cards. 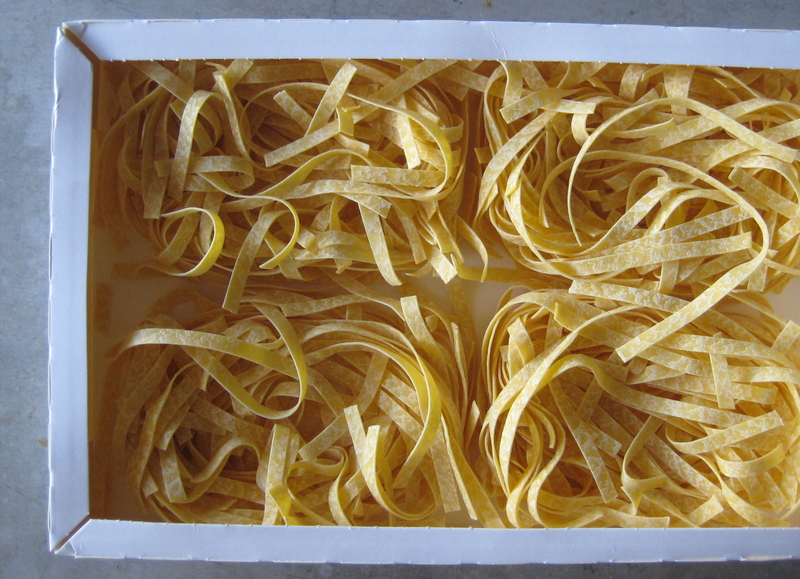 An alternative to DeCecco, if you happen to see it, is the Cipriani brand of thin egg pastas such as pappardelle or the squares called tagliardi. You can find Cipriani at fancy food shops or on amazon.com. Although it sounds silly to spend almost ten bucks on a box of pasta, it is absolutely delicious. Because eight or nine ounces will feed four people (egg pasta expands more during cooking than eggless pasta does), it falls squarely into my “life’s affordable luxuries” category. When I took stock of the refrigerator’s contents, I realized all I needed to pull together something really good for dinner on Valentine’s Day was a half pint of heavy cream. Sweet. Fettuccine Alfredo is what I have in mind. It exemplifies the Italian knack—more of a state of mind, really—of making something sumptuous out of very simple ingredients in practically no time at all. This type of thinking is just what’s needed when a weeknight meal requires a romantic frill or two. The legendary Alfredo, owner of the eponymous restaurant in Rome, is credited with creating the dish he called fettuccine al triplo burro. 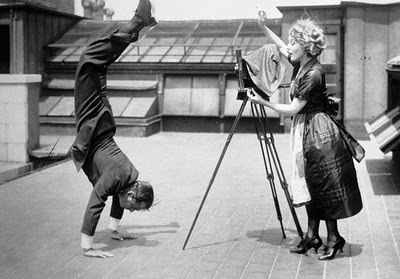 It became popular with Americans after he served it to Mary Pickford and Douglas Fairbanks on their honeymoon in 1927. Those two had buckets of joie de vivre and a great sense of occasion—they presented Alfredo with a gold fork and spoon during their visit—and I’ll bet they would have enjoyed this tribute by Katie Melua. My husband, Sam, and I will be getting home on the late side, so we’ll have this as our main course, with a salad after. We both love a fennel-orange combination after something rich and creamy. As luck would have it, there’s half of a fat, juicy fennel bulb in the fridge, and some satsumas on hand. While I’m dealing with the pasta, Sam can work some magic with those two ingredients, some excellent olive oil, and salt and pepper. Maybe there will be some chocolates for dessert. Dried egg fettuccine cooks quickly—and it should be ever-so-slightly firmer than al dente—so have the colander in the sink and the sauce ready to go. I know there are only two of us and this recipe serves more, but the leftovers will be come in handy for lunch one day, with any deficiencies in texture camouflaged with a fried egg on top. 1. Cook the fettuccine in lots of boiling salted water until just shy of al dente. Reserve ¼ cup pasta water before draining the pasta in a colander. 2. Meanwhile, cut ¼ stick butter into thin slices and set aside. Melt the remaining ¾ stick of butter in a deep skillet large enough for tossing the pasta. Add the cream and bring to a simmer over medium-low heat. Season with salt and pepper. 4. Season with salt, pepper, and, as Hazan would say, “a very tiny grating of nutmeg.” Toss again quickly and serve straight from the pan. A film-obsessed friend sent me a link to the blog A Mythical Monkey Writes About the Movies, which pinched this marvelous photo from the French blog Pictures. Since I can’t find a proper photo credit anywhere, I’m pinching it, too, with thanks. Posted: February 13th, 2012 under cooking, culinary history, pantry, people + places, recipes, Valentine's Day. I love the meal suggestion, fettucine alfredo with the fennel orange salad. I’d love to see your recipe for that. And I ordered two boxes of those noodles, they had amazing reviews on amazon and we have serious egg noodle lovers in this household. With reference to “fettuccine all’Alfredo” we have the pleasure to tell you the history of our grandfather Alfredo Di Lelio, creator of this recipe in the world known.